Enter a Bible reference to go there instantly. Conveniently consult related commentary and Bible maps in your library (may be sold separately). Search your Bibles and books for any word or phrase. Results are sorted by relevance. Right click on a verse to get a context sensitive menu that lets you highlight, bookmark, annotate and more. 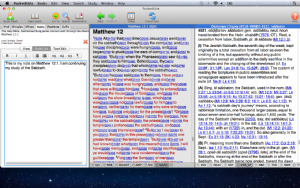 Record what you learn by adding rich text notes to any verse in the Bible and to reference books. Study the words of the Bible by adding a Strong's numbered Bible to your library. Tap on any Strong's number to view a transliteration and definition of the original language word (books sold separately). Adjust PocketBible preferences to read and study just the way you like. Expand your library at any time through our in-app bookstore. Download books directly into PocketBible and start studying right away. It began with a Kickstarter campaign and now this user-supported app is our most powerful and customizable version of PocketBible yet! 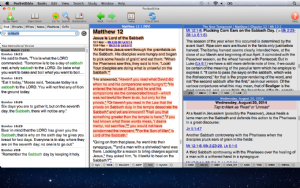 PocketBible for Mac OS was built upon our many years of experience developing Bible software along with valuable input from PocketBible users. 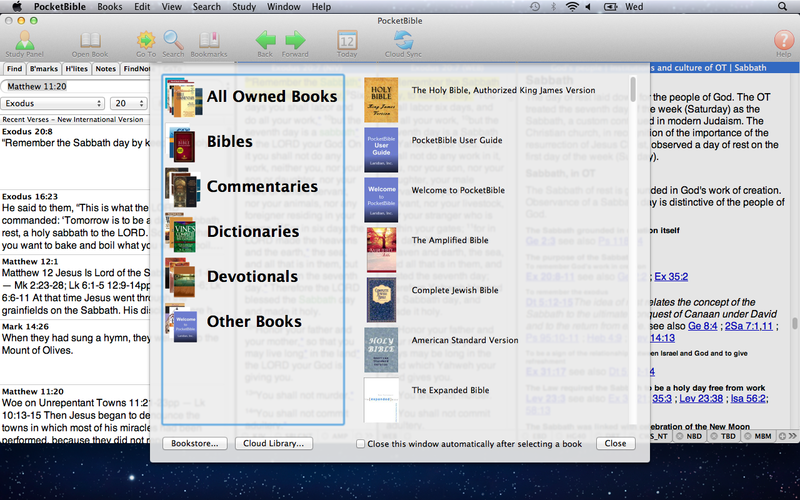 The final result is an app that may tempt even the most casual PocketBible user to buy a Mac. Download the free PocketBible app from our website. The KJV Bible is included to get you started. If you're new to PocketBible, you'll get instant access to a library of over 40 free Bibles and books upon registration. If you have an existing Laridian account, you'll have access to Bibles and books you've purchased for other platforms. You can expand your library at any time via our in-app bookstore. 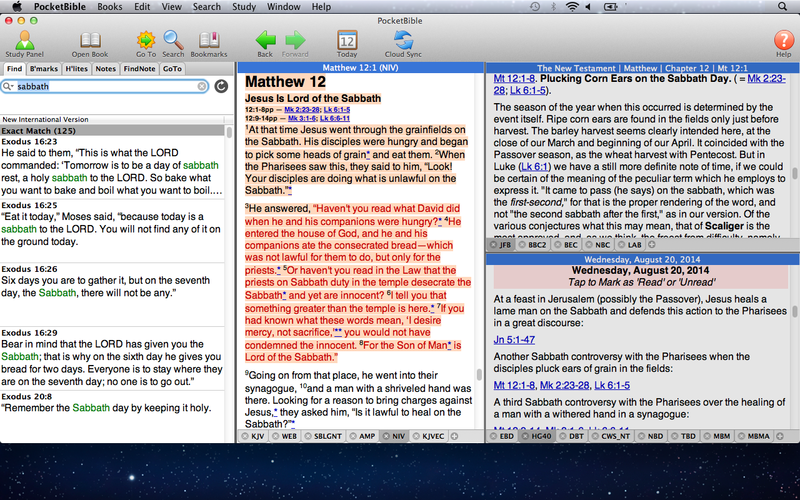 PocketBible for Mac OS offers everything you'd expect in a Bible study application and more! Powerful searching that gives you fast results! Just type in any word or phrase and PocketBible will lead you to the most likely answer. A convenient Study Panel and customizable screen layouts help you get started with your studies. Easy-to-use note-taking, highlighting and bookmarking to keep track of what you learn. Whether you're a "mouse" or a "keyboard" person, PocketBible features a variety of no-nonsense ways to navigate through your Bibles and books. 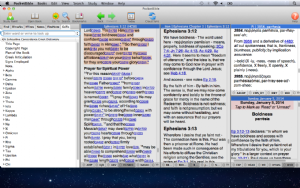 Study Panel - this optional window can be used as your Bible study hub. Tabs for GoTo, Find, Notes, Bookmarks and Highlights make it easy to navigate through your library. It is your guide to making new discoveries about God's Word and keeping track of where you've already been. Context menus - Right-click on a verse to see all the things you can do with that verse. Customizable toolbar - put your most-used items on the toolbar. Keyboard shortcuts - if you like the keyboard, we've included plenty of shortcuts to common tasks. 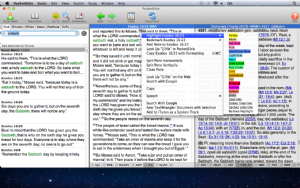 PocketBible acts like a concordance to locate anything in the Bible by word or phrase. You can search other types of books and your own notes in the same way. Smarter Searching - enter a word or phrase in PocketBible and you'll get results sorted by relevance automatically (i.e. exact match, close match, sounds like, same root). No special symbols or complicated search syntax required! 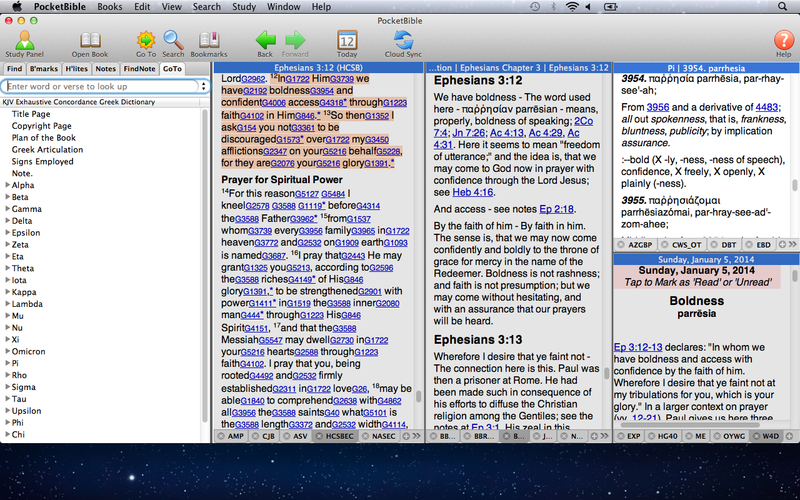 Narrow your searches by specifying highlight colors, bookmark categories, or portions of the Bible (i.e. New Testament, Pentateuch). Strong's number searches allow you to find every occurrence of a particular Greek or Hebrew word by its Strong's number in Bibles that include that feature. 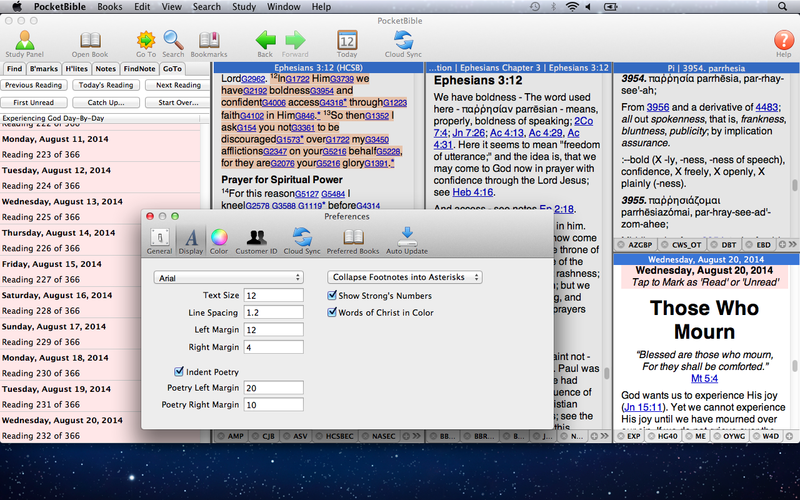 PocketBible makes common Bible study tasks a pleasure. 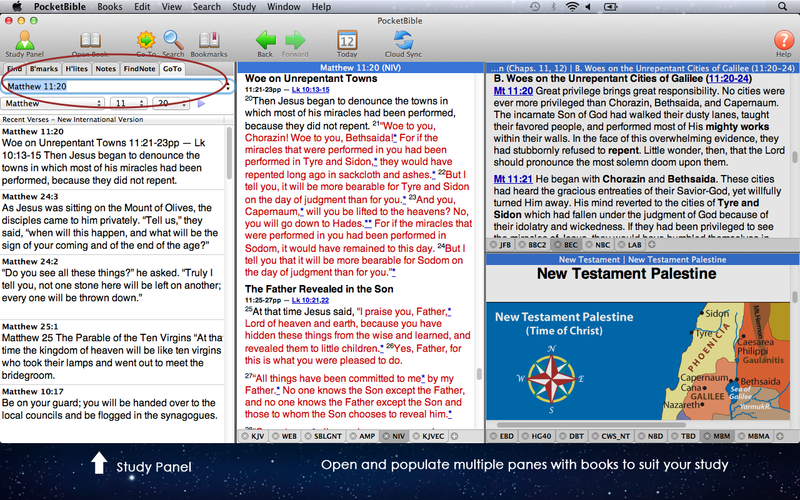 Customizable workspace - Set up PocketBible exactly how you like it! Choose from a variety of customizable screen layouts for your Bibles and books. Open any number of books in each window and drag titles from one pane to another. Parallel Bibles - view multiple Bible translations side by side. Keep reference material open and synchronized with your Bibles. 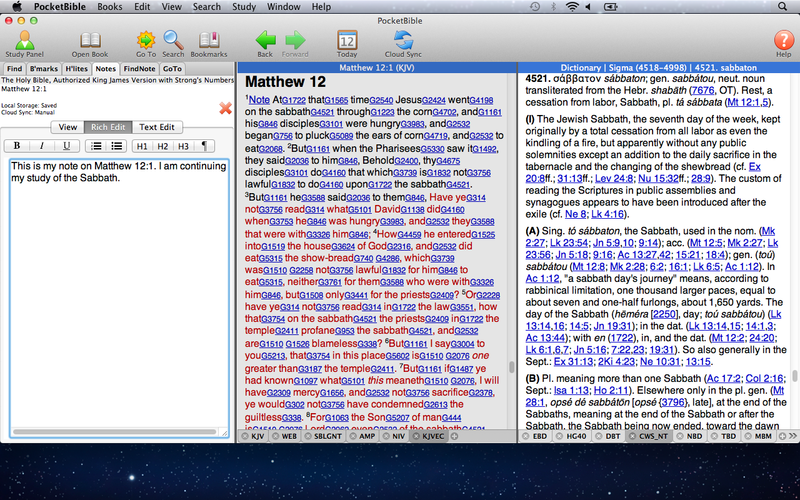 Easy cross-references - Click on Bible references in the text to view related verses in context. Quick lookup - right-click on any word to do a quick search of the current book or look up a definition. Word study - add a Bible translations with Strong's numbers and view a transliteration and definition of the original language word with one click (dictionary may be sold separately). Use Strong's numbers in your searches. Track daily Bible reading - track your progress through Bible reading plans and daily devotionals. Instantly re-schedule if you fall behind. Share Verses - copy verses or passages to other apps using the right-click menu or keyboard commands. PocketBible gives you powerful tools for recording your thoughts and keeping track of what you learn. 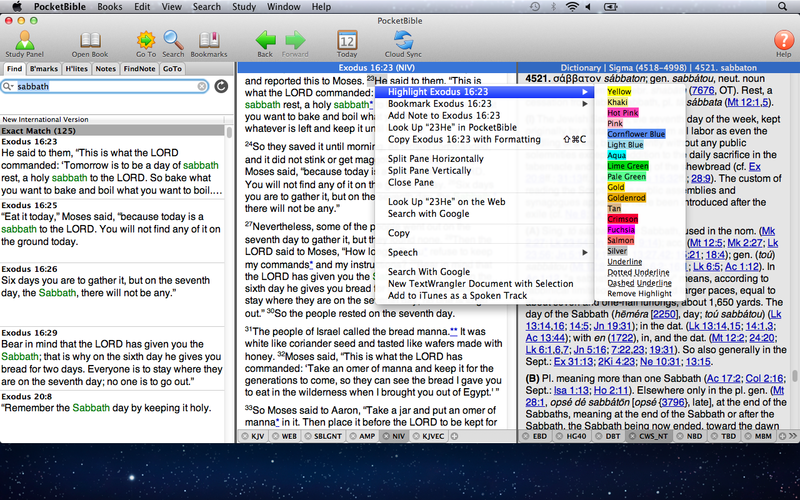 Add your own notes to any verse in the Bible or passage in a reference book. Instantly view a list of all your notes. Search your notes for any word or phrase. Add a bookmark to any verse to make it easier to find later. Create your own categories for your bookmarks and use in your searches. Browse through a list of all your bookmarks. Use color highlights or underline to mark any text. Instantly view a list of all verses you have marked and optionally use marks to focus your searches. Sync your personal data with the Laridian Cloud so notes, bookmarks and highlights are current across all your compatible devices on which you are using PocketBible. Optionally turn on automatic synchronization and you won't have to think about it again. 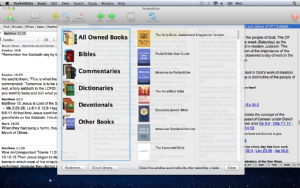 Adjust PocketBible preferences to read and study just the way you like to. 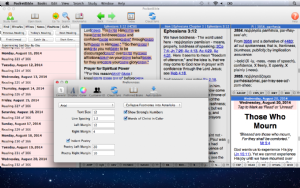 Bible Settings - enable or disable red letters for words of Christ; show or hide translator footnotes; show or hide word attributes like Strong's numbers and parsing in Bibles that support those features. Choose to display verses in paragraphs or as one verse per paragraph in Bibles that don't already show them that way. Fonts and colors - changes fonts, colors (text color, background color, active text and active background), and other styles. 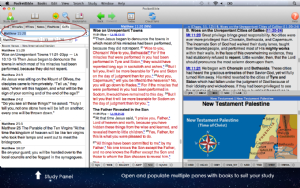 This free version of PocketBible provides all the features you need to read and study the Bible on your Mac or MacBook. But for serious study, consider a subscription to the Advanced Feature Set. Features include the Library Navigator to see everywhere the verse you're studying is mentioned; our unique Autostudy feature to bring together everything in your library to support the study of a passage or word; saved layouts to organize your screen for different tasks; and the ability to enter Journal notes — notes that are not attached to any particular Bible verse.